San Sebastian is one of Spain’s loveliest cities and also quite the Gourmet Mecca, with its numerous Michelin starred restaurants and groundbreaking chefs. It’s also an easy distance from the wine country, with the vineyards of Txakoli less than half an hour away and the mythical wine region of Rioja less than a two-hour drive. 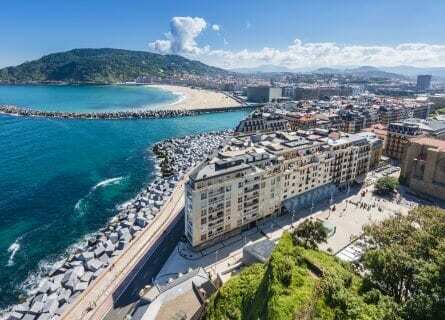 San Sebastian has one of the most glorious settings you could imagine- a small, pretty Belle Époque city nestled between the Bay of Biscay and the lush green hills of the Basque Country. The half moon bay of “La Concha” (meaning “the shell, as this beach looks like a scallop shell) is one of Spain’s nicest urban beaches and leads into the Casco Viejo (old town). The old quarter is jammed pack with quaint tapas and “pintxos” bars, Basque cider houses and traditional restaurants. Thoroughly charming! We have created this luxurious and romantic private tour of San Sebastian with a focus on wining, dining and sightseeing. You will begin your tour with a visit to a tiny, family-run Txakoli producer. You will taste their unique white wines while snacking on fresh Bonito tuna, Guindilla peppers, and olives on an enormous terrace overlooking a beautiful vine-covered valley reminiscent of Germany’s Mosel. On this tour, you will also visit some top red wine estates in La Rioja such as Roda, located in Haro. You will have your own private driver for this tour, and so you can relax and enjoy your wine tasting! The Basque lands in Spain (there is also a large portion of the Basque Country in France) are full of wonderful surprises you will experience, from picturesque fishing villages like Getaria; fairy tale medieval villages like Hondarribia; fabulous cheeses such as Idiazabal; and ultra-gourmet restaurants hidden in historic Basque farmhouses in the hills (Mugaritz, Etxebarri, and Zuberoa to name but a few). Your hotel is none other than the Maria Cristina, San Sebastian’s finest hotel located just across from the Kursaal opera house (where the annual Film Festival is held). This morning you will fly to Bilbao airport, and your elegant driver and luxurious Mercedes will be waiting for you. Drive east to the Guipúzkoa province of Basque Country (Pais Vasco) to the hills above Zarautz (a seaside resort town made famous by its resident TV celebrity chef Karlos Arguiñano). Arrive at the Txakoli wine estate of Talai Berri, one of our favorite wine families in Spain. Enjoy a short tour of this minuscule winery and a nice walk through the vineyards. Follow with a tasting of their wines paired with local Basque specialties like delicious fresh Bonito. The colorful port of Getaria is next, just down the road from Zarautz along the rugged coastline. Before sitting down to one of the best seafood lunches of your life, spend half an hour to explore this cute fishing village with its exceptionally pretty church, medieval walkways and statues dedicated to the Basque navigator Juan Sebastián del Cano (who completed Magellan’s expedition; they were the first crew to circumnavigate the world). Another famous son of this little hamlet was fashion designer Balenciaga. After some fresh air, settle into your lunch of fresh fish grilled to perfection. This is a major highlight! After lunch, your driver will take you to your romantic hotel in San Sebastian. The rest of the night is yours to enjoy the local tapas bars or perhaps have dinner at one of the great Michelins like Arzak. 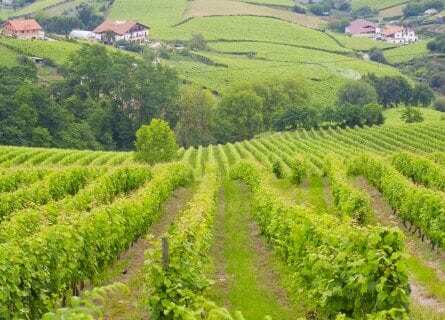 This morning your chauffeured Mercedes will pick you up at your hotel in San Sebastian or Bilbao and you will travel south through the green Basque Country into the wine region of La Rioja. This is a longish drive (approximately two hours each way) so relax and enjoy the scenery. 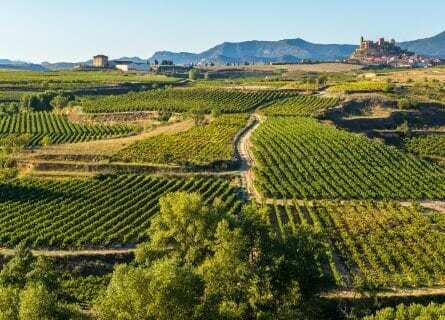 La Rioja is probably the most well-known wine region in Spain and is home to medieval hill topped villages and miles upon miles of vineyard-covered valleys. The principal grape here is the noble Tempranillo grape. You will taste some fabulous examples of Tempranillo at its best today! Your private tour will begin at a prestigious cellar such as Ramon Bilbao located in Haro. Receive a friendly welcome from your hosts followed by a private tour of the estate. You will have a tasting of the best wines the estate produces including a blockbuster wine that earned the coveted Trophy for Spanish red wine at The International Wine Challenge 2008 in London. Lunch is next to the best restaurant in Haro, in a converted monastery, an excellent chef, and service. Your last winery tour today then will be at the award-winning Roda estate, famous for their Cirsión wine and olive oils. After a fantastic day in the wine country, return to San Sebastian. Relax and freshen up before dinner. 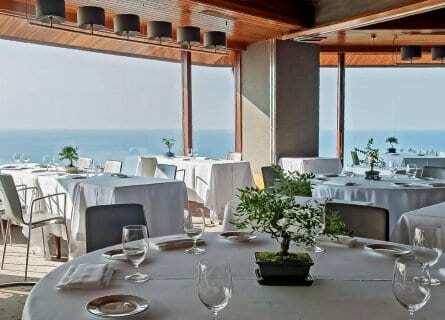 Tonight, you have a gala dinner at Three Michelin starred Akelarre. The tasting menu paired with high-end wines will be waiting for you and your table will have views over the ocean, supremely romantic. You will have a special VIP chef’s welcome by gourmet guru chef Pedro Subijana, enjoy! Today is a sightseeing day, you are not in a rush and you can travel at your own pace. Have a leisurely start if you like and at your preferred time your driver will pick you up and take you to Hondarribia, an enchanting village on the French border. Explore the town on your own or with your driver guide, taking in the cute squares, noble mansions, and views over the port. An outstanding gourmet lunch is up next at the Michelin starred Mugaritz, one of the best restaurants in Spain. Chef Andoni Luis is known as the “intellectual chef” and his creative culinary creations are mindboggling. You will have a tasting menu to try all of the chef’s flagship dishes, paired with wines from the Sierra Cantabria estate in Rioja. Unforgettable. The afternoon is yours with your driver on hand to explore San Sebastian, for example driving up Mount Igueldo to get those priceless views over San Sebastian and the Concha. Enjoy a free evening. This morning, depending on your flight time, your driver will take you to the Bilbao airport for your departure flight. We hope you have enjoyed yourself in beautiful San Sebastian and we look forward to seeing you again for another tour! It was great to make the drive because you could better appreciate how the changing landscape influences the vines/wines. I think is a nice cross-section of varietals and bodegas but the people/families behind the wines are what really make them stand out. I’m not sure if they treat everyone the way they treated us but we really felt special. We know there is no way in the world we would have known where to go, have found the bodegas or have been welcomed into the fold or have been given access to such special and fabulous wines. My regret: that I didn’t bring suitcases of the wines home to the states!